THE WRITING BUDDHA - Opinions | Books | Movies: Sadhana Who Stalked Her? by Spandana Chakradhar (Book Review: 4*/5) !!! Sadhana Who Stalked Her? by Spandana Chakradhar (Book Review: 4*/5) !!! It becomes very critical to choose a book in a thriller genre from an author who is writing for the first time. 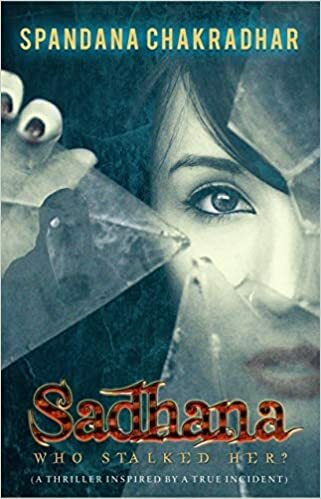 I don’t know what made me pick up the book named “Sadhana Who Stalked Her?” written by the debutante, Spandana Chakradhar but now that I have completed reading the 260-pages book, I must say it was a thrilling and distinct feeling to go through a book of such kind. I remember reading one of the books by Novoneel Chakraborty, one of my favorite authors, based on the similar concept. The way that book gave me the chills, no other book has been able to, but this one really came close by. The book is about a girl named, Sadhana, who is living a great life and has beautiful people with whom she is teamed up with but one thing starts spoiling her wonderful life. She is being stalked by someone whenever she goes to sleep in night. In spite of all the precautions and arrangements by her and her friends, they are unable to trace the person behind this. They start guessing the stalker with whom they can raise their doubts upon. They doubt everyone but not the person who is really behind it. This is always an important part in a thriller where the climax should reveal something that really comes up as suspense and not that can be predicted. While reading, even I predicted who could be behind the protagonist but I had not gone close to the person who turned out to be the real criminal behind everything. The characterization done by the authoress is great. Though the story has too many characters who are introduced in first 5-10 pages itself but the way each of them are given attention throughout the story is commendable. There are very less authors who can manage to do this. Regarding the narrative used to describe the stalking segment, it is very well written and actually makes you feel as if it’s happening in front of your eyes. The romantic angle given with both- Manav and Abhinav of Sadhana was a great idea to keep the story light with those little conversations full of love. The message that authoress has tried giving with the book is nice. Why self-defence and confidence as a girl is necessary to fight our own battles is nicely portrayed in the book. As the book says that it has been inspired by a true incident, this book could become a motivator to many. There are many in our country who are stalked, bullied, molested, harassed, troubled on regular basis. Reading something like this can surely motivate anyone to go ahead to develop themselves to fight against such people. Talking about the drawbacks of the book, the first thing is: - the book could have been composed in 200 pages against 260 pages. Secondly, the narration is made quite in a hurry state where if you get busy in some thought, you would find yourself reading something altogether different than what you were reading five sentences back. Lastly, I didn’t like the over-confusion of the protagonist regarding which partner to choose out of two and getting romantically involved with both of them for quite some time. Reading those parts felt weird where even both the boys are aware of this. May be, I am still close-minded. Overall, this book is a page-turner for sure. I give it 4 stars out of 5.